News flash: Knitting is good for your health! Read all about it on Amazon.com: Project Knitwell Presents The Comfort of Knitting, a Leisure Arts publication produced by Lion Brand® Yarn Company*. This unique how-to-knit book focuses on helping families and caregivers alleviate stresses such as anxiety, sadness, and fatigue. Lion Brand is donating 50% of its proceeds from the book to Project Knitwell and 50% to the Alzheimers Association. The Comfort of Knitting includes seven easy projects: an afgahan, a scarf, and a hat. 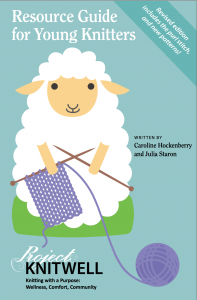 This is a 20-page guide written by a teen knitter for young people learning to knit while in the hospital. It is designed to help them improve their skills independently. Useful for all beginner knitters, the guide provides how-to’s for starting and ending a knit project, simple knit patterns, on-line and print resources, a list of yarn stores in the Washington, DC, area, and more. It is available for purchase at fibre space, Looped Yarn Works, Second Story Knits, and Yarn Cloud for $7. To order via Internet, click here. You will be prompted to register. To register, scroll down and click on: “Continue donation as new account.” If you are already registered, simply login. Both of the guides above were initially funded by the Ronald McDonald House Charities (TM) of Greater Washington, DC, and Project Knitwell is grateful for their support.